Ok, I know this sounds kind of weird. Maybe it is. I’m getting down to the end of items in my fridge and that always breeds some unique combinations. This one really worked out though. If you struggle a little with brussels sprouts you might find that adding the sweet potatoes will get you over the hump. That said, I’m not a proponent of wasting your time, energy and calories eating things you hate. (I’ve given up making salmon at home for this very reason). Feel free to use just the sweet potatoes or just the sprouts. Your call. I like the mix. There’s not really a recipe for this. 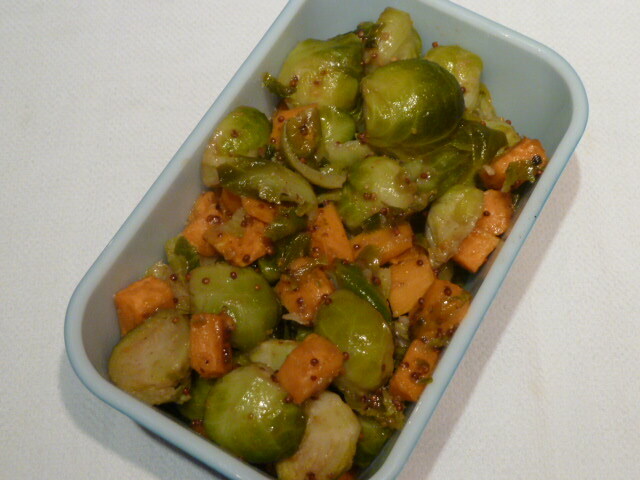 I steamed some sprouts on the stove top while I roasted some diced sweet potato in the oven. I threw everything in a cast iron skillet with some bacon grease. Often you’ll see recipes that include one or the other of these vegetables with bacon or pancetta or some such so that’s where the bacon grease thing came from. Feel free to use olive or canola oil or butter if you prefer. Stir them around in the hot oil until you get a little browning on everything then turn the heat off. Cast iron will hold heat a long time so don’t worry about things getting cold. The sauce is a combination of maple syrup, stone ground mustard, dijon mustard, Worchestershire sauce and balsamic vinegar. Sweet and tangy. Just stir it together and add a little more of this or that until it tastes good to you. This entry was posted on February 10, 2013 at 8:40 pm and is filed under Easy, Sides. You can follow any responses to this entry through the RSS 2.0 feed. You can leave a response, or trackback from your own site.